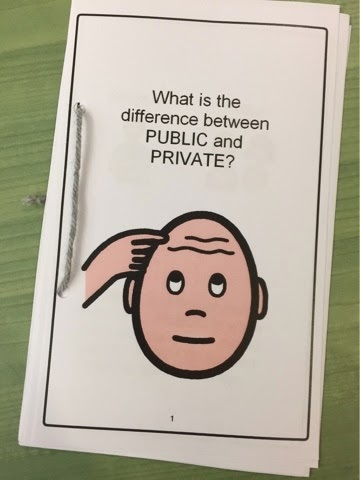 Teaching the different between public and private is important for so many reasons for our students with special needs. When teaching these concepts, I first talk about the difference between public and private places. We come up with a list and sort those places accordingly using visuals of one person versus multiple people. I created this sort from a boardmaker template and uploaded here on Board Maker Online. After talking about places, we move on to talking about both public and private places AND behaviors. We talk about what behaviors are appropriate in each area. This book and additional resources are found for free here and are available in PDF or Boardmaker files. Here's the other Board Maker Online activity that includes both public and private places and behaviors. Plus, check out all of these other great activities for this topic on Board Maker Online. If you are looking for something more detailed to use with your students, I found this resource here. It is very informative and I didn't feel the need to go that in depth, but completely understand how some students might need those specifics. I will actually be doing this at the start of our sexual health unit on Monday. My district uses the last resource you posted as our sexual health curriculum, known as FLASH, put out by the King County Health Depth in Seattle Wa. People can just google it to get the whole thing, including the section for Special education students. I use anatomically correct dolls, as well, which were a big hit last year. I will also incorporate some Circles curriculum. There will be some overlap in our posts this week, so I plan to link back to yours. Hope things are going well with your pregnancy! 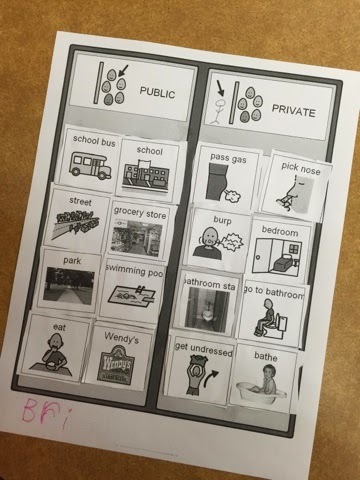 Do you have the cut and paste sort as a printable in your TPT store? I had a look but couldn't find it. I would love to use it with my class. It's available on boardmaker online via the first link in the post. Hope that helps!